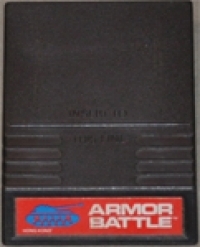 Box Text: It's armored conflict and you command the spearhead! 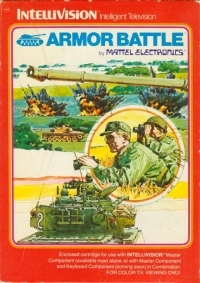 Combat missions galore in this computerized tank battle! Maneuver two tanks through hundreds of different terrains! Battles are waged with a full complement of simulated sound effects to add to the realism! 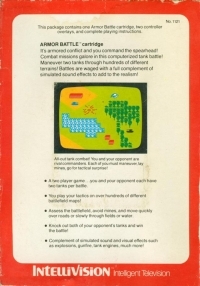 -A two player game...you and your opponent each have two tanks per battle. -You play your tactics on over hundreds of different battlefield maps! -Assess the battlefield,avoid mines,and move quickly over roads or slowly through fields or water. -Knock out both of your opponent’s tanks and win the battle! -Complement of simulated sound and visual effects such as explosions, gunfire, tank engines, much more! 01-20-2016 aliensstudios Box Text It's armored conflict and you command the spearhead! Combat missions galore in this computerized tank battle! Maneuver two tanks through hundreds of different terrains! Battles are waged with a full complement of simulated sound effects to add to the realism! -A two player game...you and your opponent each have two tanks per battle. -You play your tactics on over hundreds of different battlefield maps! -Assess the battlefield,avoid mines,and move quickly over roads or slowly through fields or water. -Knock out both of your opponent’s tanks and win the battle! -Complement of simulated sound and visual effects such as explosions, gunfire, tank engines, much more! 09-24-2011 hexen Box Text It's armored conflict and you command the spearhead! Combat missions galore in this computerized tank battle! Maneuver two tanks through hundreds of different terrains! Battles are waged with a full complement of simulated sound effects to add to the realism! This is a list of VGCollect users who have Armor Battle (red label) in their Collection. This is a list of VGCollect users who have Armor Battle (red label) in their Sell List. This is a list of VGCollect users who have Armor Battle (red label) in their Wish List.